Meet wizards of the airwaves, Calen Le Couteur and Russell Thompson, aka the dynamic duo putting Queensland acts on the map as hosts of Phoenix Radio’s Emerge program, broadcast every Monday night from 7-9 PM. Part of the University of Southern Queensland’s student-run project Phoenix Radio, Emerge has been a platform for local artists for well over five years, with Calen taking the reins as host in 2016 and Russell coming on board soon after. 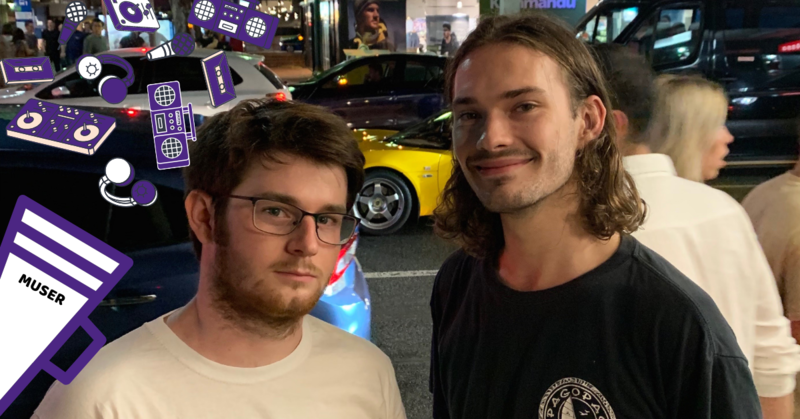 What started as university work experience has since become a calling for the pair, who’ve transformed the show into a vibrant community that tune in to hear the latest and greatest Queensland-made tunes and music news. Friends since high school with a shared passion for music and media, Calen and Russell make an enviable team and together deliver an entertaining show each week featuring live interviews, performances, gig and record reviews as well as Russell’s infamous music news segment. Some of the familiar faces to call Emerge their second home are local indie-pop love Tiarne, whimsical indie gem Aiden Bradley and Brisbane juggernaut Jeremy Neale. Recent acts on the show also include musical guns Cigány Weaver, Milk Buttons, Clea and Sweater Curse to name a few. “Queensland is one of the luckiest regions in the country to witness a developing music platform,” said Russell. As for what’s next on the agenda for this talented pair, we’re stoked to announce that Calen and Russell will be adding online credentials to their radio work, collaborating with Music Is My Muse to turn their popular on-air reviews into articles to be published on our website each week. “This is the start of a beautiful collaboration between two huge supporters of the Queensland scene. I’m excited to share our love of the local community and for Emerge and MIMM to grow together,” said Calen. “Collaboration always leads to great things. It’s awesome to be joining people who are so passionate about the local scene and want to support it in the same way,” adds Russell. Three cheers for our April Musers Of The Moment, Calen and Russell, and all that they do for local music through Emerge Radio. Tune into Emerge Monday nights 7-9PM HERE and follow Emerge on Facebook to stay in-the-loop with the latest QLD music goss! And tune in weekly to read Calen and Russell’s latest reviews, right here on MIMM! Muser of the Moment is a monthly feature celebrating hard-working individuals doing brilliant things to support the Queensland music scene.